Extra Large Superview Baby Safety Mirror. 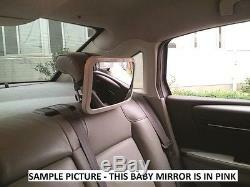 Must have for all mothers & farther cars (allows you to see your baby in your interior mirror). Adjustable baby safety mirror - Adjusts to suit your position. Designed to help you see your baby when they are in a rearward facing car seat, without having to turn your head whilst driving. Mirror attaches in seconds to rear seat head rest and rotates and pivots for a clear view. No obstruction to rear view visibility. Looks great in your car interior because it is a neat & tidy mirror. High Quality Branded Product - Long Lasting. Brand new product in attractive packaging. SAMPLE PICTURE TO SHOW HOW THIS ITEM WORKS - Please note this will be in Pink. This is a 5 star rated product. (please see the below at some reviews). As a parent who regularly drives between London and Newcastle/Lake district we clock a lot of hours on the road. Like most kids our baby girl seems to find car journeys relaxing and usually drops off to sleep but she can't cover that kind of distance without waking up. We'd not really made the connection that baby seats face the wrong way in the back seat of a car to see what's going on and with a little one you really want to know if each noise is just part of sleep, needing to pull over asap or just awake and happily mesmerised by her foot. It's really big (slightly bigger than a sheet of A4 paper) and very clear with no blisters or distortions. It's curved to give you a very wide view of your baby in the back seat and just a glance in the rearview mirror gives enough visibility to clearly see not only your baby's face, but the whole car seat width and a decent chunk of your baby's body. It's easily enough to see what's going on and put your mind at ease. It attaches easily to any car headrest using adjustable straps. It won't matter what type of car you have as long as there's a headrest because you can just clip or tie it on. When in place it doesn't vibrate around and stays nice and steady for a clear view. An added benefit we hadn't expected is your baby can see you too. Their view is great when you're turned round and they can watch you as you drive - a big help for separation anxiety - there's a huge difference between a baby only being able to look at the backrest of a chair, or being able to see you're still there - even if you're not looking at them. As time's gone on and our little girls' got older she has made the connection that she can look at the driver in the rearview mirror. A gentle word or silly noise usually quacking in our case - thankyou CBeebies / Twirlywoos! Combined with some eye contact in the mirror has averted more than one meltdown. My little boy is now 8 weeks old and I so wish I had this when he was first born. I hated driving on my own and would stop regularly on short journeys to check on him. When driving with my husband I would make him sit in the back to keep an eye on him. The mirror took seconds to fit, yet is secure. It's a good size unlike some of the others allowing for a clear view. As the mirror is plastic I'm not worried about it shattering like a glass one. I can drive along quite happily, checking every so often that my boy is fine. Plus he also loves looking at himself in it. Bought this when we travelled to south of France with our 6 month old - wanted to have peace of mind on the long journey, to keep in check that she was positioned properly, awake or asleep and it made the daunting trip fantastic. The mirror is big enough that she can see us in it and as a result completely relaxes in the car now (before she was a bit frantic). Since then we keep one in both cars and at 8 months it's great to have a good view of her without turning around. No faults, fits great in two different cars, stays firmly in place, great clarity of image, large view. I bought another brand for my partner's car, and promptly took it back and ordered another one of these, it is really superior on all fronts. Here at Motionperformance we highly recommend the Sumex Brand. Sumex has positioned itself as the European leader in group distribution of car accessories with the clear objective of serving both the enthusiast car customization you are looking for novelty, as one audience that may just need a timely and concrete accessory for your vehicle. The Sumex brand consists of two product ranges, the Car+ range which offers comfortable & convenient car products and the Race Sport range which offers sporty, improvement and modification products, All at top fine quality. With a wide international coverage Sumex is present in over 50 countries through distributors which include Spain, France, Italy, Portugal Germany and the UK. You will need to pay for the cost of returning the item(s) and the item(s) remain your responsibility until we receive them. We accept Credit or Debit card payments. 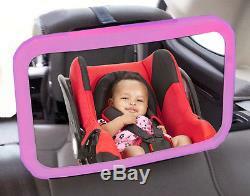 The item "Wide Extra Large Baby Car Seat & Child Safety Parent View Travel Mirror Pink" is in sale since Tuesday, December 15, 2015.